so in case you ever wanted to know what I'd look like "sans" a front tooth..tada!!! 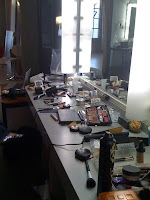 here was the make-up table at the studio....make-up palooza! We never know what trouble lies ahead...all I know is that you need to be mentally prepared. We can't let things bother us so much that is destroys the rest of our day. We need to remember that we can't let anyone have the permission to make us feel less-than, or to let a situation steal our joy. We can take comfort knowing that God will give us double for our trouble! ha ha ha Remember we can give all our cares to God..and he will give us the answers and strength to deal with anything. Troubles are a part of life...we just need to work out our mental muscles and prepare ourselves to be strong and ready to handle things with strength and pass it on to God to do the rest. I pray that all of you have a wonderful day...and your troubles will be running the other direction! PS...Hi to Kristel from the H & M store at the 3rd Street Promenade, for recognizing me and saying she reads my blog and is a youtube subscriber!!!! yay!!!! Imagine I am there, to give you a "mental" hug, to go through whatever you are going through...and say, "you can do it"!....this will pass, and we'll be stronger!!! Your positive outlook on life and life's stresses and troubles is so encouraging, and I'm working hard to adopt a similar "give my stresses up to God" outlook. Its very difficult, but I think I might get there. I wanna meet you sooo bad. you seem like such a sweet woman! Saw your Twitter status... and OMG I thought you were serious at first!! kandee, I love you. Truly. Not in the stalkerish way, lol. But you have seriously made me smile everytime I read your blog. It gives me a little more hope for a better tomorrow. 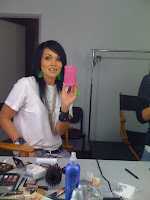 By the way, what is that lip combo you are wearing, Kandee? It's perfection! I see you have some CoverFX concealers and setting powder, how do you like the brand? Kandee, Girl you are just such a breath of fresh air in this doom and gloom world we live in. So many are afraid to say the name of God for fear of offending, and I gotta tell you, it does my heart so much good to read your posts! God bless you abundantly for spreading so much Love!!! Thank you so much for this post! Your words have given me some much needed peace. Ummm I think I love you. thank you for this post you totally gave me inspiration because although my day started crazy i realize its not worth being mad over my day is what I make of it no one else!!! Luv your blog! Thank you for your honesty, i agree with Powerlifterchick, for staying firm in what you believe and not being afraid to say it. May God continue to bless you. I really enjoy your posts. I look forward to them, you always seem to put a smile in my face. My girls are so funny, everytime i try some new hair style or make up and i ask their opinion, they smile and say your name! Love you girl. Keep on doing what you do. Hey Kandee..I just wanted to say that I really appreciate your outlook on life. I have been trying to make that the way I see things in life and to hear someone like you confirms to me that it is possible. I love the fact that you see God as loving as He His and willing to do anything for us. So many people are fearful of Him and it blocks them from seeing HOW MUCH He loves them and how He wants to take care of them if they just let Him. Thank you Kandee. Thank you from me and thank you from everyone else out there. I'm sure there are a lot of people that feel the way I do about your encouraging words. haha you're hilarious! thanks for cheering me up! Kandee... Thank you! I really needed this today! Your amazing! Im going to start printing these and putting them in my daughters journal for when shes older. These words of wisdom will come in handy one day for her, Im sure! ha ha ha ha!! You're so funny Kandee. you always make my day! about 5 months ago, I had to have my front tooth pulled (same one you blacked out) due to a severe root fracture and I have been so depressed over having to have a fake tooth. You have been the first person to make me smile while being 'toothless'. My boyfriend told me after the surgery that I was a "cute hillbilly" and now I can actually smile about it! Kandee, you encourage me everyday. Thank you for all your kind words you post here and say in your videos. You're beautiful, inside and out. :) I hope I'm lucky enough to meet you one day! Kandee, i truly believe that God talks through random people and your troubles blog completely spoke to me! My problem has always been that I am too sensitive and I let people's attitudes get the best of me. I let a bad situation get the best of my day but now I'm dropping it on the floor to be swept away! Thank you for your encouraging words! You truly are a SHINING STAR!!! 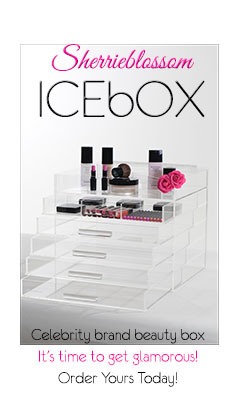 I love this Kandee! What you said reminded me of 2Corinthians 1:3 "Praise be to the God and Father of our Lord Jesus Christ, the Father of compassion and the God of all comfort, who comforts us in all our troubles, so that we can comfort those in any trouble with the comfort we ourselves have received from God". It's so inspiring to see Him use you to bless everybody and you're such a light :) thanks girl! Awww. Kandee, I certainly hope those feeing weren't spawned by any of us at the shoot. I personally, thoroughly enjoyed the time to get to know you and the girls and though we were crunched for time and education it was well worth my trip. I hope all was not a loss for you. Sometimes it's hard when we are all running here and there and trying to balance plates on sticks (so to speak.) Travels, kids, networking, last min. projects, jobs, fundraisers... it's tough to find time to look at what all is going on and say, "YES. I AM DOING IT." and YOU ARE and you inspire others to find it within themselves to be able to say the same. We all have overcome hurts, habits and hang ups... addictions, loss, death, divorce, homelessness, abuse, poverty, out of control children, shattered dreams and broken hearts. What may be a boring simple "another day in the life project" to one might be the beginning of a fresh start and the first hurdle to another. Thanks for enduring.